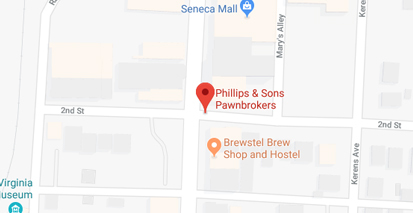 Welcome to Phillips and Son’s Pawnbrokers. If you need cash fast then come on in and bring an item of value. We loan money fast on everyday items that you have around the house. Here are some of the best items to Pawn. Scrap Jewelry – Gold and silver jewelry intrinsically holds value as the market dictates. Gather up your jewelry and scrap then come get an immediate offer in store. Guns – Gun sales and pawns are always welcomed, as long as the appropriate guidelines are followed. For starters, you must be the actual owner of the gun you’re trying to pawn. We buy, sell and trade all types of firearms including shotguns, rifles, pistols and revolvers. Always please be sure the weapon is unloaded before bringing in. RESPONSIBLE concealed carry is WELCOMED in our store. High-End Electronics – Higher-end electronics, including relatively large LED and LCD TVs, new gaming systems, digital cameras, tablets, laptops, and phones are promising pawn items. Just make sure your item is complete and in excellent condition to get the most value from it. Missing cords & controllers can reduce the value considerably. Also, make sure that the devices are fully charged before coming to the store so we can test the items quickly and efficiently. Gas and Battery-Powered Tools – There’s a huge secondhand market for power tools, both gas and battery powered. Like your electronics, you’ll want to make sure that all of the components (cords, accessories, etc.) are with the item for maximum value, plus charge them or fill them with gas before bringing them to the shop so you can demonstrate that they work. As these items have a propensity to get dirty, taking a soapy garage rag to them before showing them often isn’t a bad idea either. Coins and Currency – A sure bet at Phillips & Sons Pawn is gold & silver coins and currency. Collectors frequent pawnshops to find rare currency for their collections, so the market is strong. Ideal pieces to bring into the shop include U.S. collectible coins, gold coins, silver dollars, half-dollars, American Eagles, proof sets, silver certificates, Federal Reserve Notes and rare paper money. Musical Instruments – A story on NBC News a few years ago revealed that musical instruments are popular pawn items. This includes guitars, banjos, amplifiers, violins, and other accessories and instruments. To get top dollar be sure to include any extra components. Rare Collectibles and Items with Historical Value – You might have some hidden treasures in your own attic, basement, or displayed in your house. The value will increase if your item is a rare collectible or has historical value. Planes, Trains, Automobiles – We even do occasional loans on larger items such as vehicles, tractors, ATVs, side by sides, motorcycles, etc.